Our introductory youth circus classes offer instruction in a variety of circus disciplines including but not limited to: aerials (trapeze, lyra, silks), tumbling, juggling, and more! Class begins with a prop manipulation warm up and circus games, with the majority of class time dedicated to and aerial work. We offer a variety of levels for youth students of all movement backgrounds and abilities. Level 1: For youth students of all ages with no previous circus background. Level 2: For students who have successfully completed Youth Level 1 or have a dedicated movement background in gymnastic, dance, or cheer. Students must be able to hold their weight in the air with bent arms and knees to chest for 10 seconds. Students must be 7 or older to participate in Level 2, or permission of the instructor. Levels 3/4: Students must have permission of the instructor and be able to perform both a Russian and a Classic Climb confidently and repeatedly on both sides, invert from the ground, and wrap footlocks in the air with ease. Youth Aerials 3/4 is for students who have successfully completed Levels 1 and 2, and have received permission of the instructor to enroll in this class. Youth Levels 3 and 4 are more intensive instruction in aerials, and a focus on building a solid foundation of skills on both vertical and horizontal apparatus. Youth Performance Program: Permission of the instructor only. This is a two-session class for the serious youth aerialist looking to work hard and focus on building an act. New skills will be taught and expected to be practiced until mastery. First session will focus on skill building, second session will focus on act creation. Students must take both sessions to be eligible for the December recital. Students are expected to maintain behavior associated with an appropriate maturity level of this class. Students will be expected to practice independently and productively while the instructor is working with others. A guardian must be present for the first class to go over our code of conduct. Students who fail to follow these standards will be removed from the class. Ready for the workout of your life? We’ll work on exercises that you can work into your daily routine in order to build the endurance, strength, flexibility and muscle control found in true circus beasts. All levels welcome and encouraged. There will be a small amount of work done on aerial apparatuses, but no aerial experience is necessary. 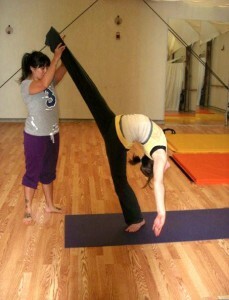 This class focuses on building flexibility towards contortion work. Increase your range of motion while simultaneously building the strength to control it. We’ll do a warm up, and a variety of stretches that incorporate our surroundings, many of which you’ll be able to take home. We’ll talk about safe stretching practices and injury prevention so that you can walk away not only with a greater range of motion, but a better understanding of how your body works! Whether you’re a total beginner or someone who’s working on getting your press-up, this class has something for you! We’ll work together on tricks and drills to keep the body solid and operating as a single unit within that elusive perfect handstand line. We’ll also spend time on other balancing skills, including crocodiles, and learn how to strengthen and stretch the body for hand-balancing success. In this class we’ll focus on the building blocks of acrobatics: cartwheels, rolls, walkovers, introducing more advanced skills as students are ready. We’ll also work on partnering and handstand related skills to build versatility. We’ll begin with learning the basics of partner based weight sharing, and we’ll focus on both partner and group based poses, introducing more difficult skills as students are ready. We’ll work on learning a variety of shapes and transitions, as well as safe spotting techniques and experimentation. 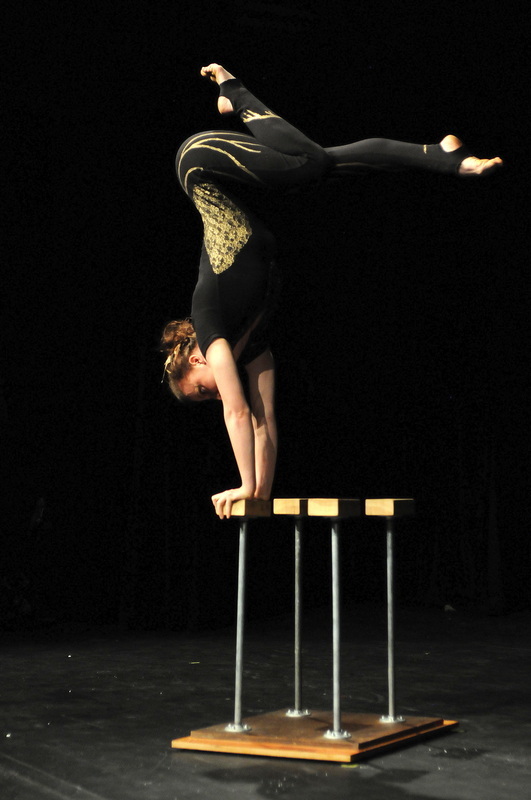 This class will incorporate elements of ‘acro yoga’ and more traditional sport acrobatics. This class starts with an instructor led warm-up and stretching to enhance acrobatic work, followed by tumbling and drills with conditioning at the end. In this class we’ll work on the fundamentals of Chinese Pole–a variety of climbs, sits, and poses, introducing more dynamic and strength based skills as students are ready. Class will end with learning how to use the pole for strengthening and conditioning. Chinese Pole is a challenging, but extremely rewarding apparatus!Students will want to wear clothes that will cover their armpits and midriff. Please bring soft soled athletic shoes such as feiyue martial arts shoes or adidas wrestling shoes. Intro to Fire Arts is a comprehensive survey introduction to the world of fire dancing/spinning with an emphasis on proper safety procedures and protocols. We will focus on introducing prop manipulation in the form of poi, staff, and hoop, and fire eating/fleshing, and our work will culminate in lighting our props on fire in the last few classes. Students will receive a pair of practice poi as part of their enrollment fee. Together, Nick and Stacey have almost 20 years of fire spinning experience. They have performed alone and together from Maine to Virginia Beach, and have been heavily involved with Wildfire Retreat as the Safety Manager (Nick), the Class Coordinator (Stacey) and later as the Pre-Event Manager (Stacey). We’ll begin with learning the basics of partner based weight sharing, and we’ll focus on both partner and group based poses, introducing more difficult skills as students are ready. We’ll work on learning a variety of shapes and transitions, as well as safe spotting techniques and experimentation. This class will incorporate elements of ‘acro yoga’ and more traditional sport acrobatics. Come solo or bring a friend! Tumbling warm up will focus on basic skills such as cartwheels, rolls, walkovers, and handstands, introducing more advanced skills as students are ready.